Can’t believe we’re on the last day of fun with our friends at Stampendous! For our finale, we have Shellye McDaniel and Valerie Ward showing us what they created and it’s stunning! Don’t forget to read all the way to the bottom for our giveaways! I’m always looking for fun favor boxes for co-workers and students, so I chose to create a pillow box. I added Adhesive Dots Small in a dotted pattern over the front of the box. To the Adhesive Dots, I sprinkled on some of the Stampendous Violet Opaque Embossing Powder. 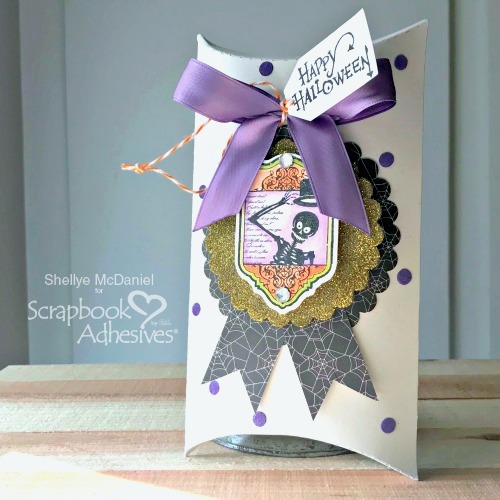 Next, I created the embellishment with layers of the stamped Skeleton image from the Halloween Labels Cling Stamps and Dies, a glittered scalloped circle and a larger scalloped circle. The tag sentiment was stamped and then die-cut using the matching die and then tied to the top of the embellishment. 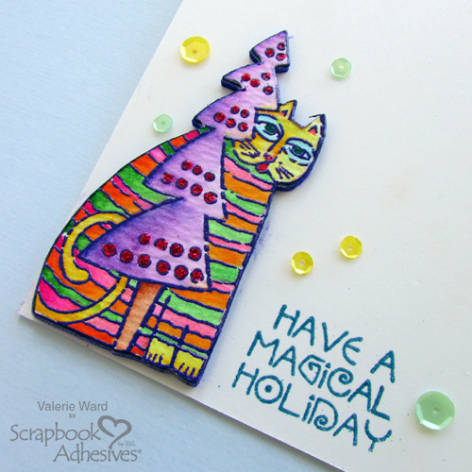 My card is a CAS holiday card with a non-traditional, modernistic look! It features the Laurel Burch Holiday Friends Cling Stamps and Dies Set and the Converge 5-Jar Kit Embossing Powder. I stamped the image and the sentiment with embossing ink, and used the purple embossing powder from the Converge Embossing Powder Set for the main image, and the blue embossing powder from the same Converge Embossing Powder Set for the sentiment. Then I colored the main image with markers. I wanted to pop up the main image, so after I die cut it out, I adhered it to a matching die cut piece of foam with my E-Z Runner Permanent Fine Adhesive. Then I used my E-Z Runner Grand Refillable Dispenser to attach it to the card. I felt the card needed a little bling, so I attached sequins to the card with Adhesive Dots Micro. 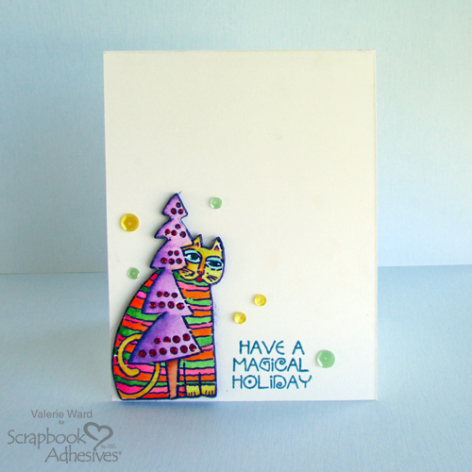 Day 2, CLICK: Holiday Cheer with Stampendous – Day 2.
and for Day 4, CLICK: Card Making Merriment with Stampendous – Day 4. 2018 Blog Hop with Stampendous – Day 5. If you cannot see the comment section (at the bottom of this post), please CLICK: Holiday Fun with Stampendous – Day 5 and scroll down to the bottom of the post. This entry was posted in 3D Foam Squares, Adhesive Dots & Lines, Adhesives, Announcement, Crafts & Tutorials, Extreme Double-Sided Tapes, Fall, Gifts, HomeHobby by 3L, Intermediate, Party Favors, Permanent Adhesive, Seasonal Craft Ideas, Skill Level, Wear your Adhesive on the Outside and tagged 3D Foam Squares Mix Black, 3D Foam Squares Regular Black, Adhesive Dots Micro, Adhesive Dots Small, Blog Hop, Card, Card Making, Christmas, E-Z Runner Grand Dispenser, E-Z Runner Grand Permanent Strips Refill, E-Z Runner Permanent Fine, Embossing Powder, Extreme Double-Sided Tape 1/2", Giveaway, Halloween, Heat Embossing, Holiday, HomeHobby by 3L, Shellye McDaniel, Stampendous, Treat Container, Valerie Ward, Wear Your Adhesive on the Outside. Bookmark the permalink. 13 Responses to "Holiday Fun with Stampendous – Day 5"
Such a fun treat box! Thank you for the hop and inspiration! 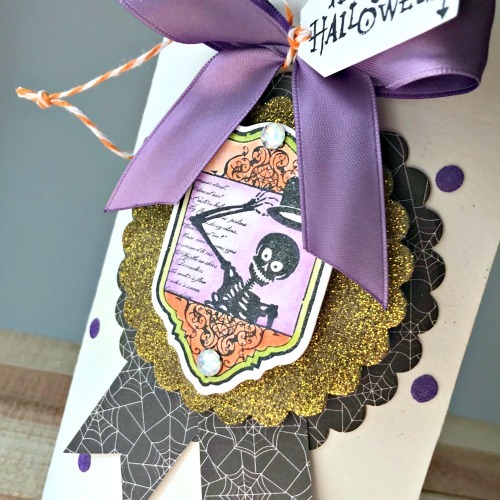 Cute Halloween favor box and adorable card! The pillow box is really awesome and would be great to hand out to kids on Halloween! I love Laurel Burch designs and so I love the very pretty card! Great CAS design. Love the fun Halloween pillow box! Cute tag and details! And the Laurel Burch design with the cat and tree is awesome! Delightful colors on the card! Fantastic projects. Super fun treat pouch, perfect amount of scary. Lovely card, super cool cat image and I love the clean design. Awesome inspiration here using stamps and adhesive. Great job!! And the cat card is so fun. Wonderful projects shared today. Thanks for the creative inspiration.